Your vacuum sealer is capable of preserving a variety of foods in your kitchen, from raw ingredients to homemade dishes that can last for weeks. Guacamole is a crowd-pleasing dip ideal for serving on many different occasions, but chances are, you'll have quite a bit left over after your event. 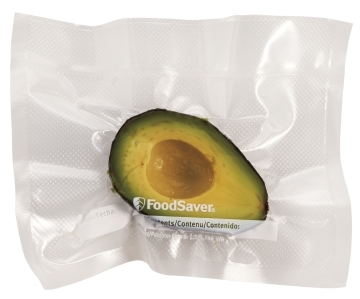 Instead of throwing out your delectable dish after the fact, keep it fresh with your FoodSaver® Vacuum Sealer - The Fresh Starter Kit, which has features that can preserve your guacamole whether it's stored in a jar, container or freezer bag. After preparing your favorite guacamole recipe, consider transferring the dip to a small jar that can be sealed tightly to prevent critters, chemicals or air particles from altering its taste or color. Begin by using a large spoon to move your guacamole from the bowl to the jar, wiping the lid to remove any excess dip from the surface. Vacuum Sealer Digest recommended leaving at least 1 inch of space between the lid and the contents of the jar to prevent food from getting sucked into the machine. Cover the jar with the flat metal top that covers the glass, keeping the metal ring to the side until you're finished. Attach your FoodSaver® Regular Jar Sealer to the top of the jar and allow the food sealer to remove the air from the container with the attachment tube, preserving your guacamole in its entirety. The National Center for Home Food Preservation noted that if kept in a cool, dry place, the contents of your vacuum sealed jar may last for up to a year if left unopened. If you prefer keeping your guacamole stored in large batches, consider freezing it in large bags. First, place your container of guacamole in the freezer for 45-60 minutes. You want the mixture to begin the freezing process, but not become too rigid. When the guacamole has become firm but not frozen, transfer it to a vacuum sealer bag. Use your FoodSaver® Vacuum Sealer to preserve your dip, removing the air and using pressure to keep the guacamole contained. This method is ideal for those trips you take to wholesale stores. Next time you buy avocados or onions in bulk, put them to good use by whipping up a large batch of guacamole and storing it in the freezer in smaller portions for future parties or individual servings.